Sure....I've had several solo shows. Sure....I mounted CYBER FYBER last January. Sure....I've been planning for this coming February's show....BUT THIS IS SCARY! I've got so much to do before then! Blues Chapel and Last Words now has its own blog. It is meant to function as a one-stop Internet destination for information. It is listed on the exhibition cards that just arrived. It is listed on the press release. It will link images and information for the email invitation from Gallery 80808/Vista Studios' 1600+ database. I'll use it on Facebook. So...I'm not repeating it here but providing this LINK! I've also updated my page on the Gallery 80808/Vista Studios' website...and all the images in its "portfolio". It is HERE! I've got a group of volunteers lined up to help with the physical demands of installing all this artwork. I've got two awesome friends to act as "ushers" for Blues Chapel during the reception. The reception is partnered with Blue Martini....a late night bar located in the same building. Blue Martini is providing Eboniramm, a local blues singer who will be performing as "Bessie Smith". I'm still stitching additional Grave Rubbing Quilts....which will keep me occupied on our return trip to Texas and later today while we head north to Pennsylvania. We're spending New Year with my parents in Slippery Rock. Stitching always calms my nerves.....with so much to do and worry about....I need to stitch up a storm! February 4th will be here soon! PS I updated "My Family Blog" with a couple of photos taken during Christmas! 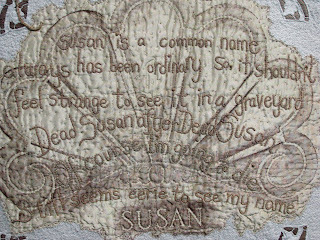 This is the largest Grave Rubbing Quilt to date...nearly foot feet square. It is also the only one that is entirely hand stitched. I started it months ago...in April...but put it aside. Last spring I only knew how I wanted the center of the quilt. It took time to contemplate the words, my own epitaph, and then more time to figure out exactly how I wanted to incorporate them. 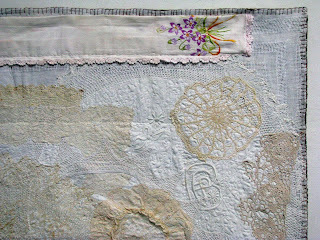 I had to think about the stitches that would create different textures to the various sections. Also, the words required basting....something I almost never do. Anyway, the center was done; the kantha styled running stitches between the edge of the tablecloth and the edge of the quilt were done; and the tablecloth was firmly attached to the recycled curtain. 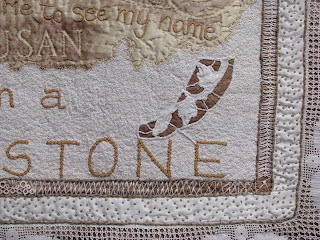 Then this quilt just lay out of the way...waiting for me to think about the words I'd select for an epitaph. Who am I? How would I like to be remembered? What legacy do I intend to leave? What personality traits define my actions? I've read thousands of epitaphs. I've free motion embroidered hundreds onto sheer chiffon banners for my installation this coming February. Still, it took weeks to sift through these ideas until I came up with the right phrases and a plan for their inclusion on this quilt. Last month everything fell into place. Most of the seeding stitched and French knotted areas on the tablecloth were done in the rental truck on the way to Texas to install Blues Chapel at the Greater Denton Arts Council's Gough Gallery. I also figured out how I wanted to create a unique back for the quilt. Linda is the incredible fiber artist who posed for the Decision Portrait Series piece On Fighting Ovarian Cancer. (To view this portrait, click HERE.) 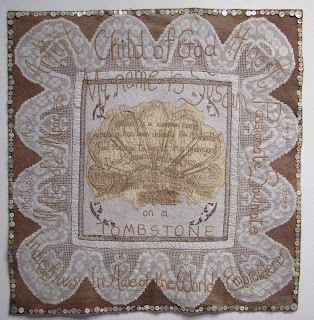 She has always made supportive comments on this blog and been a big fan of the Grave Rubbing Quilts too. She sent me the vintage linens I used on the reverse. She has faced death bravely and won a battle over ovarian cancer; she knows how precious life is and how to live it well. 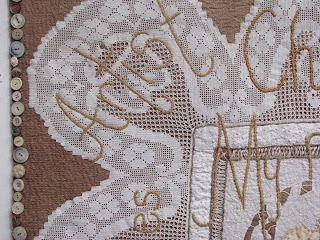 There was no question that the linens and lace she donated would be part of this, my personal epitaph. 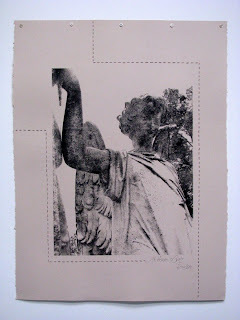 Although I have more than a dozen angel images transferred onto the soft, printmaking paper still waiting for stitches, I only ordered twenty-five sheets of 100% cotton rag mat board on which to mount them. 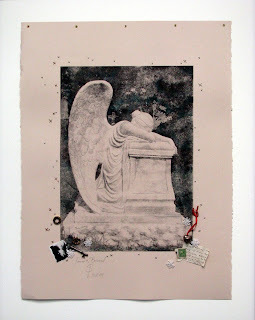 Thus, these are the last of the "Angels in Mourning Series" for awhile. From the start I listed the "framed" and "paper" size; but, if the truth be told, I only had a single frame. Steve is now busy building the other twenty-four. By Christmas they'll all be ready to hang....with plenty of time before my show in February. There's still too much to do and too little time. At least this much is accomplished! Recently I finished four pieces in the "In Box Series" to take to the Grovewood Gallery, but I actually started six. So, yesterday I got one of the other two done. 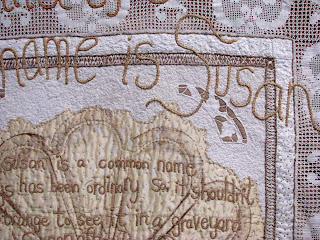 I'm not sure when the sixth will be finished though because I'm back to stitching epitaphs on the sheer chiffon. In the meantime, Blues Chapel made the Denton Record-Chronicle. This was the result of a lovely telephone interview with Lucinda Breeding. It can be read HERE but I included it on this post as well. Obviously, I'm thrilled! 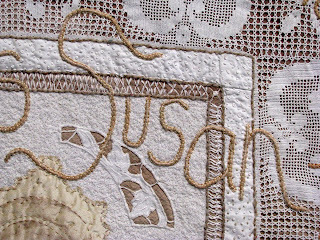 Artist Susan Lenz didn’t begin her artistic career until her children were grown. It was even later when she took interest in women who lived loudly, sang the blues like no one else and then faded into obscurity. To look at any piece in “Blues Chapel” in the Ray and Georgia Gough Gallery at the Center for the Visual Arts in downtown Denton, you’d think art and the blues were the artist’s lifelong passions. The work in the Columbia, S.C., artist’s solo installation betrays Lenz’s eye and hand — both are steady and both are strong. Her tribute to women who sang the blues feels like Lenz approached it with a library of knowledge in her head. 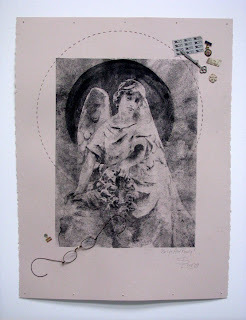 “Blues Chapel” establishes Lenz as an embroiderer, an installation artist and a found object artist. The installation begins as soon as you enter the Gough Gallery. The walls are lined with pieces that recall Orthodox and Roman Catholic sacred art. The viewer passes a piece, Altar of Forgiveness, an altar dressed with painted railroad ties, wrapped nails and found objects like candles and bottle caps. Viewers are invited to write their sins on slips of paper and drop them into a box. Lenz said she will burn the papers — without reading them — as a symbolic act. Tapestry in Blue, a 24-piece block quilt, is an atmospheric installation by self-described contemporary embroiderer Susan Lenz. The masterpiece of the installation is Tapestry in Blue. 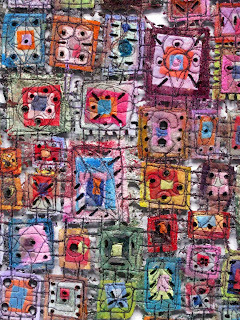 Twenty-four block quilt pieces each bear the face of a female blues singer adorned with a gold halo. They also recall icons found in the Orthodox Church. Flat, sober paintings of saints are referenced in Tapestry. A row of old church pews stretches out in front of the block quilt, and spread on the floor below is a grouping of objects — blue glass bottles, blackening roses, vinyl records set into antique wooden offering plates. A string of white Christmas lights winds its way around the altar-like offerings. Funeral parlor-style paper fans are placed on the pews, as are pamphlets about the installation. Music by the women represented plays softly. Lenz started studying female blues singers only after she saw a small photo exhibit at the National Museum of Women in the Arts in Washington, D.C., in fall 2005. An artist had photos of 25 female blues singers displayed with their biographies in chronological order. Her research led to the creation of Tapestry in Blue, an installation that has evolved over time. She wanted to create something that might honor the transcendent part of the singers’ legacies. Lenz said the singers were working in a male-dominated industry and didn’t get credit for songwriting, the credibility for attracting crowds or the money that men in the business got. “Blues Chapel” is an effort to honor the sacrifices they made to music. Lenz doesn’t have a formal background in art. Lenz said she remembers picking up a booklet that explained requirements for entering, and noticing all the names of the needlework crafts. 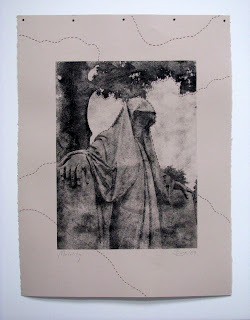 “I’d been to Assisi, but I didn’t have any idea what kind of relationship it had to embroidery. I realized I had a lot to learn,” Lenz said. Lenz ended up winning a blue ribbon for a pillow slip she’d made. Lenz delved into the art form after that. 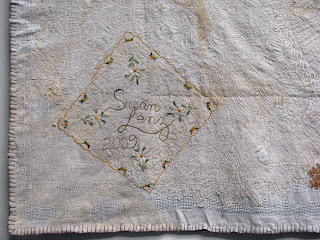 When her husband got a job in South Carolina, Lenz joined a guild and got to know its collective of women who viewed their needlework as a legitimate cultural contribution. She said their mentorship gave her work depth and breadth. 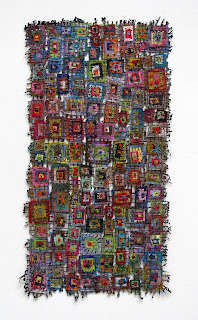 “I went to a workshop in 1996 and saw the two winners of the contemporary embroidery category. I knew when I laid eyes on it that this is what I wanted to do,” she said. 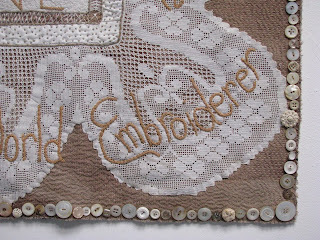 Contemporary embroidery uses the tools and techniques of traditional embroidery — fine fabrics and threads — to produce nontraditional work. 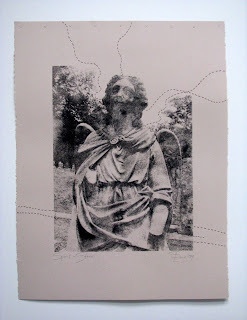 Contemporary embroiderers do portraiture, abstract design and the like. Some contemporary embroiderers are creating graphic T-shirts using needlework where others would use a screenprinting method. 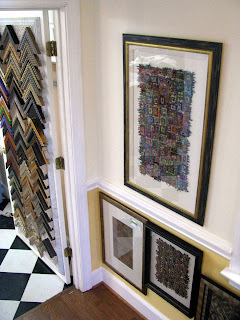 Lenz began a framing business in Columbia, too. Her business bounded until she had 14 employees in her charge, employees with paid vacation and insurance benefits. When she got serious about art, she made the painful decision to downsize. Gradually, she began producing art and getting it into coffeehouses. 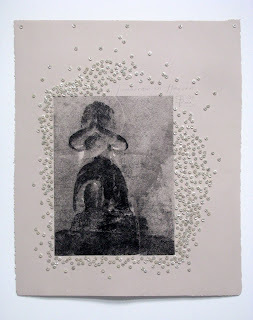 She joined a cooperative gallery in 2002, a move that pushed her to study and work more. 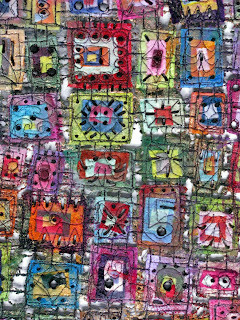 The exhibit runs through Jan. 8 in the Ray and Georgia Gough Gallery in the Center for the Visual Arts, 400 E. Hickory St. Gallery hours are 1 to 5 p.m. Tuesday through Sunday. For more information or to schedule a docent tour, call 940-382-2787 or visit www.dentonarts.com. 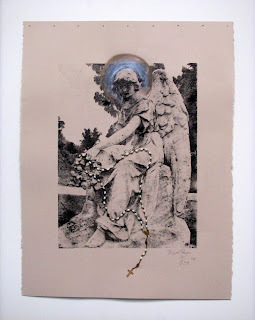 Nail Triptych accepted at Handcrafted...more Angels! Yesterday afternoon while working in my studio, I got a telephone call telling me that Nail Triptych was accepted into the national juried fine arts craft show Handcrafted at the Rocky Mount Imperial in North Carolina. (Currently Nail Triptych is at the Greater Denton Arts Council's Gough Gallery as part of my solo show Blues Chapel....listed as "submitted for exhibition.) It is rare to get a personal telephone call. I'm elated! 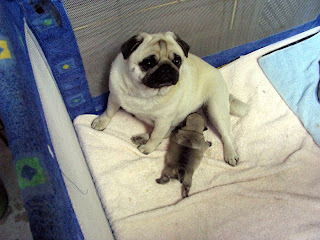 Yet, the "best angels" I saw yesterday were undoubtedly the two baby pugs born about ten days ago to Molly. 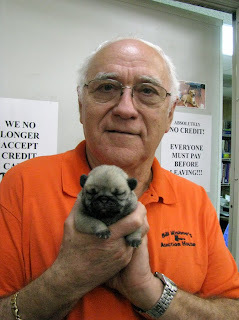 Belonging to Bill Mishoe, Molly was at Bill's weekly Friday night auction....sweetly nursing the pups in a crib in the office. There's also a walk-around "table lot" auction every other Tuesday. I love attending as often as I can....a place to watch unique items sell to the highest bidder while stitching on my latest Grave Rubbing Quilt. 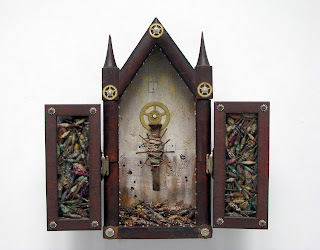 It seems totally appropriate to post images from Bill Mishoes with the Nail Triptych....after all, I got the clock case and gears from this very location! 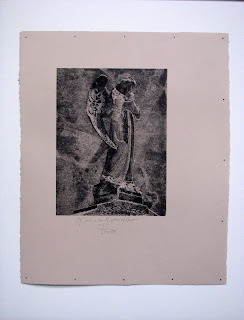 Earlier in the week two more pieces in the "Angels in Mourning Series" were completed. 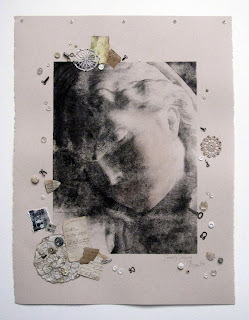 Selecting snippets of handwriting, scraps of lace, vintage buttons, and neglected snapshots from an old photo album bought at an auction feels like creating a narrative or leaving a few clues to some unknown identity. Stitching through the paper requires careful concentration and a delicate hand....which also feels appropriate for suggesting some long-since-gone life. I've seen her work before but at the last South Carolina State fair I was positively driven to arrange a "lesson"....a day to watch Ginnie in front of her gigantic computer screen making subtle, transparent layers between assembled images that result in a surreal environment that evokes a sense of spirituality, a touch of history, and breath-taking beauty. Yesterday was the day. I'm still digesting all the ideas, tips, software, and organizational skills that I witnessed. Without a doubt, something from yesterday will figure into future work. My self-imposed February deadline is looming. 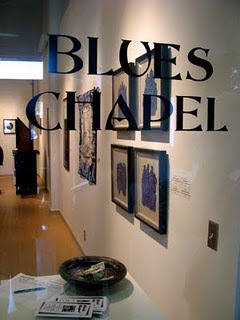 In less than two months Blues Chapel will have returned from Texas and be installed at Gallery 80808/Vista Studios. It will fill the large space. I'm not worried about this part of the exhibition...even though at least three pieces have been sold. My focus really isn't on this part of the show. 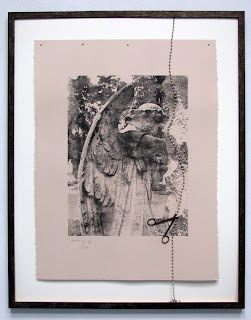 It might seem strange, but the entire reason for mounting this exhibition is to have an opportunity to photograph the Epitaph Installation with its associated work. My thinking is simple: I've already built the "church" (Blues Chapel); now I'm building the "graveyard" (which I'm calling "Last Words"....although I might later call is "Everlasting"....which one sounds better?) With proper photographs, I can begin to submit for future solo shows elsewhere. The work is coming along wonderfully. 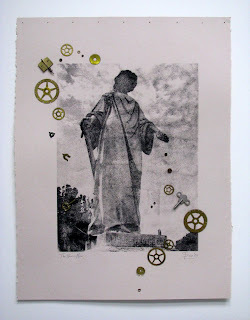 Yet, I continue to think up new ideas for other, related pieces of art. There's no way to get it all done before February 4th! One of the reasons I am continually inspired is that I am continually finding new places to investigate. 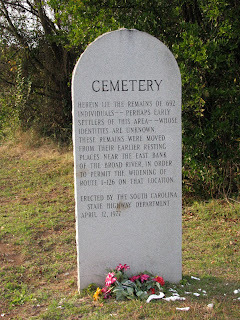 Over the weekend I found the South Carolina State Cemetery. 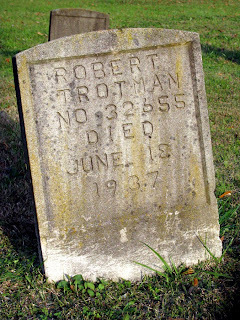 Using Google Maps....on "satellite" mode....I saw a little dirt road off one of the paved roads in the local cemetery. I went on my moped. Although still in the city, only a mile from the State Capitol building, only four blocks from my house....I was all alone under a perfect blue sky with tall trees on all sides. The only sign of "civilization" was the nearby, empty railroad line. At the end of the dirt road was a surprisingly well kept clearing. 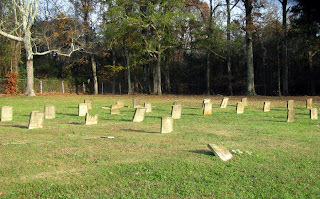 This is the South Carolina State cemetery...resting places for prisoners, mostly from the 1930s. Beyond these markers is a bright white, 8 foot tall, fence around a very small plot of land. It wasn't locked. I went inside. 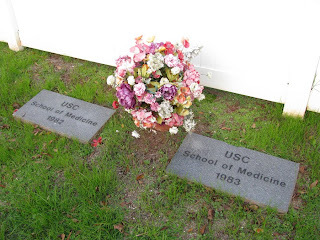 The manicured lawn and bench made this a very special location for the physical remains of bodies donated to the University of South Carolina's School of Medicine. All weekend I thought about society's funeral customs and the complications that must be addressed when someone's death or last requests aren't "the norm". This really is "food for thought" but also inspiration for creativity. 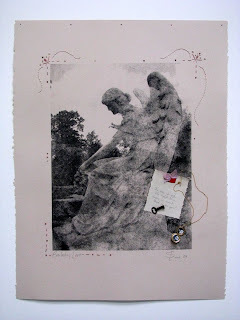 While I thought, I worked....on several more pieces in my Angels in Mourning Series. Okay....I know this series have pretty much taken over my life, but that's NOT what it is all about. I'm not obsessed with "death" but with all the things I want to accomplish beforehand. There are so many things I want to "recycle".... incorporate with textiles and stitches...breathe new life into something old....etc. That's exactly what I did with a lovely little glass bead and wire necklace that my sister Wanda sent to me. She was clearing out a storage bin...found it...and knew I'd love it for art. It reminded me of all my artificial flowers. So, refashioned it into the Key of Everlasting Life. (Far above). Thank you Wanda! It is perfect! 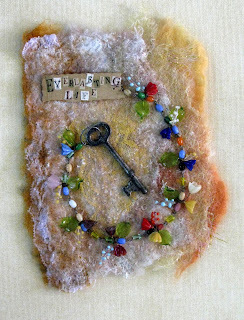 It will replace one of the "keys" that were sold from my Decisions Installation...even though it was inspired by my "Last Words" or "Everlasting" work! I guess everything I do is related! 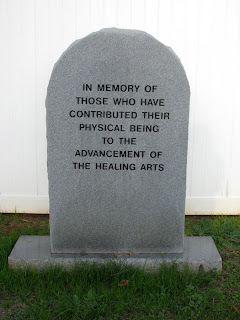 Now...I don't just "hang out" in cemeteries! 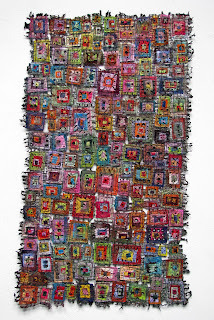 I also make it a point to see new, contemporary textiles whenever possible. Last Friday, while dropping off new work at the Grovewood Gallery, I was able to spend time in the gallery space (Spotlight Gallery) there. The show was called L.I.N.T. (Ladies in New Textiles). 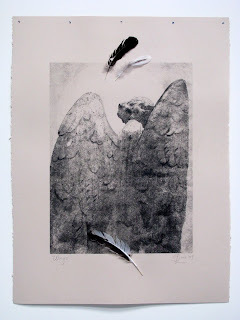 The show featured works By: Norma Bradley, Peggy Debell, Diana Denardis, Sondra Dorn, Vicki Essig, Suzanne Gernandt, Susan Webb Lee, Janice Maddox, Bernie Rowell, Judy Simmons, Kathy Spencer, Jude Stuecker and Jen Swearington. 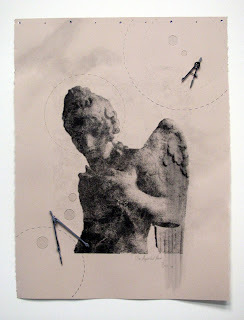 I was particularly fond of Bernie Rowell's Envelope Series. 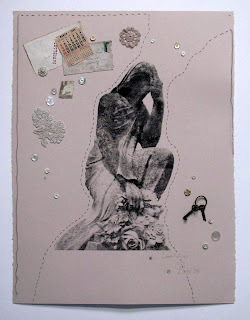 I'm also a fan of canceled stamps, vintage handwriting, and the combination of paper and textiles with stitch. 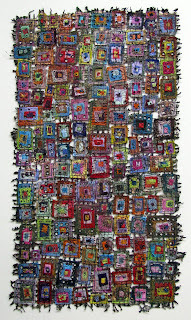 Suzanne Gernandt's work perfectly blended painted papers, weaving, and stitch. 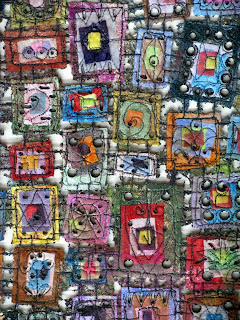 She listed the work as "mixed media weaving"....a perfect way to categorize them. Her craftsmanship was brilliant. 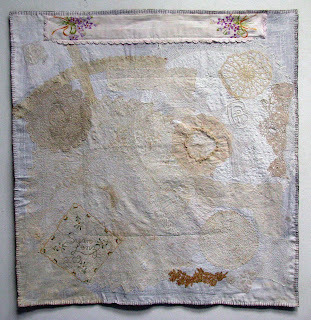 Jen Swearington uses old household textiles to "illustrate stories that have yet to be written." I'm totally drawn to this notion of "repurposing" material! I found another article about Blues Chapel. This one appears in the Denton Record Chronicle. The actual article is HERE! I've copied the article below. Reading how others describe my work is a thrill. 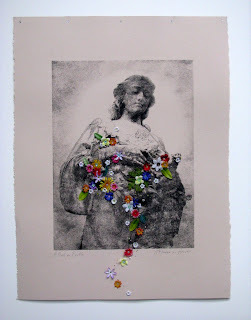 It makes me think....consider new ways of looking at art, even my own. The feedback enriches my emotional experience as an artist.....so THANK YOU....to every one who has sent and email, written a comment, and looked at my work in person or through this blog. This is providing a mental dialogue that will deepen my abilities to make significant art. Also, I finished another piece for the Grovewood Gallery....just in time to go to Asheville later in the day! Artist Susan Lenz’s “Blues Chapel” is a tribute to African-American women who rivaled bluesmen in talent. It’s also a tenacious exploration of another craft still pushed to the margin because largely female hands make it: fiber art. Lenz’s exhibit, now showing in the Gough Gallery at the Center for the Visual Arts, is by turns funny, sad, devotional and defiant. 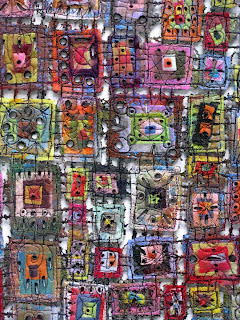 Lenz uses found objects in her work, which looks like it was created through a hybrid of quilting, lace-making and hand-dyeing. It’s through the coincidental nature of the found objects that Lenz teaches a cheeky lesson about obscurity, and how women who should have found great fame — the inimitable Ma Rainey, Nina Simone and Ethel Waters — didn’t. The faces of these singers are in a lot of the work, some of which recalls Orthodox Christian icons. Meanwhile, Tapestry in Blue honors 24 early female blues singers by depicting them as martyrs, in prints pieced together as a traditional block quilt. Beneath the tapestry are wooden offering plates filled with vinyl records, empty blue wine bottles and blackened roses. The exhibit runs through Jan. 8. Admission is free. Gallery hours are 1 to 5 p.m. Tuesday through Sunday. The arts center, at 400 E. Hickory St., will be closed Dec. 24-25, Dec. 28, Dec. 31 and Jan 1. For more information, or to arrange docent tours, call 940-382-2787 or visit www.dentonarts.com. “Storybook Quilts,” an exhibit of work by members of the Denton Quilt Guild, runs through Jan. 8 in the Meadows Gallery at the center. One of my two New Year's Resolutions for 2009 was to find gallery representation....something prestigious, established, and respected. A place that wanted my larger, more serious pieces...not my bookmarks and Christmas ornaments....a place that represents fine craft artists who regularly show in American Craft Council shows and national juried exhibitions. It took most of the year. 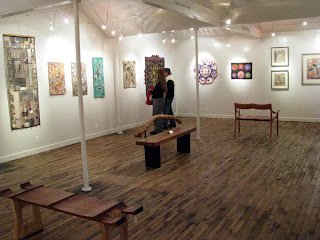 In September my work was accepted at the Grovewood Gallery in Asheville, NC. I was thrilled then and I'm thrilled now! Work is SELLING! I'll be taking these three pieces (and a fourth one that isn't quite finished!) to Asheville on Friday. It is so exciting! 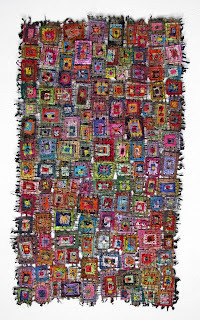 My other 2009 New Year's Resolution was to get accepted in an international juried show....and I'm over the moon about my acceptance into Quilt Elements 2010. So....what's the New Year's Resolution(s) for 2010? I'm thinking about affiliations. I don't really have any...like SAQA or SDA. What are the best ones? Which organizations would really help my fledgling art career grow to a higher tier of respect? Any suggestions? I forgot to snap a photo of In Box LV before framing it. Perhaps this is a good thing as the photo below really does give the right impression of how these works look once finished and hanging on a wall!